This prize-winning novel is about a young woman who unknowingly signs up to teach classes at an all-black college in New Orleans in 1920. It is one of the best--and earliest--views of breaking the color line as well as a touching love story of a man and woman of different races. Worth Tuttle, a champion of minority rights, was born in Raleigh, N.C. She graduated in 1916 from Trinity College in Durham (now Duke University) and attended the Columbia University School of Journalism. She married Walter Page Hedden in 1919, and after writing short stories as well as essays about women and blacks for leading magazines, she turned to novels. 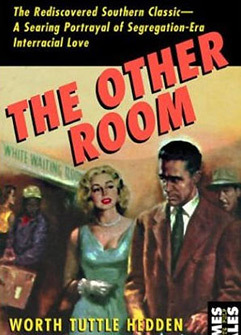 The Other Room, published in 1947, won the Southern Authors Award for the most distinguished book of the year by a Southern author on a Southern subject, and an Anisfield-Wolfe Award as one of the best books on race relations. Her other books included Wives of High Pasture, a novel of the Oneida community; Love Is a Wound, about a triangle involving a Methodist minister, his wife and his sister-in-law, and Two and Three Make One: The Story of a Family. The latter, a personal family memoir, was written under the pseudonym Winifred Woodley.